I’ve had the immense privilege to eat with some of the great chefs of the world. Some of them even came out of the kitchen to speak with us, like Carme Ruscalleda at Restaurant Sant Pau (three Michelin stars) and Fina Puigdevall of Les Cols (two stars). 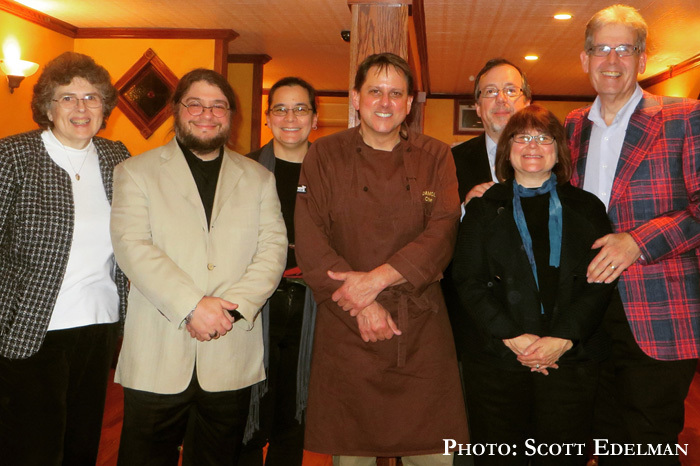 Many, including those two, go to great lengths to include local ingredients and traditions in their cuisine. None, though, go to the lengths of Damon Baehrel. Scott quoted the proprietor of a restaurant called Rose’s Luxury as saying: “I’m not in the food business, I’m in the happiness business.” This was a sentiment Damon Baehrel agreed with wholeheartedly at one point during the course of the seven-hour meal we spent with him. His chef clothes are brown and embroidered with the words “Chef/Grower.” Baehrel is more than that. He’s his restaurant’s sole employee, playing the part of farmer, cheesemaker, waiter, charcuterie expert, host, chef, et cetera. He is quite literally chief cook and bottle-washer. He’s also one of the friendliest, most energetic people I’ve ever met. I had no idea what to expect, but the moment we set foot in the door of his farmhouse restaurant his warmth and effusiveness set me at ease. “I really appreciate you being here,” he said, and it felt completely sincere. “Diners like you make it possible for me to live my dream on this land.” This is a person who loves life and loves what he’s doing, which is living a lifestyle that makes him almost monkish in his devotion to his art. 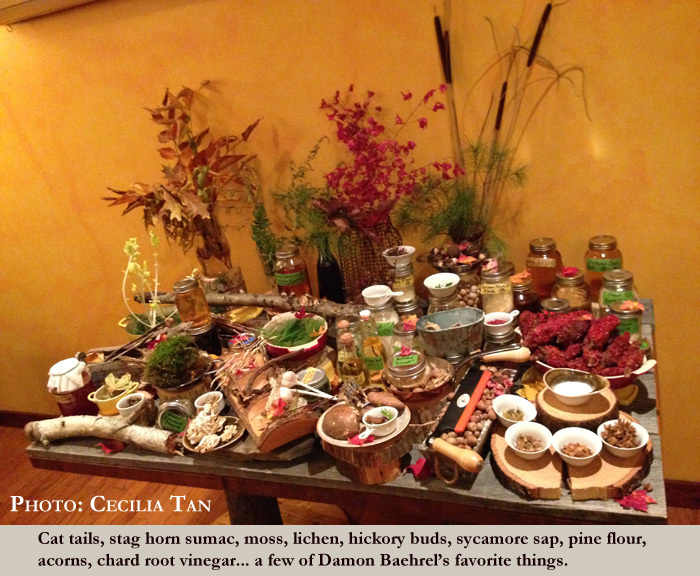 Almost everything that hits the table in a Damon Baehrel meal was sourced from the 12 acres on which the restaurant sits. The delicious bread made from acorn and goldenrod flour? Those acorns had to be harvested two years earlier and painstakingly leached of bitterness before they could be ground into flour. The grapeseed oil you dip the bread into? Pressed by hand from grapes grown right on the property. The sea salt sprinkled atop the bread? Damon brought 100 gallons of sea water home from a trip to Maine and evaporated it himself. By the way, when I say pressed “by hand,” I mean it: no machinery was used. Hand-turned presses and rocks seem to be Baehrel’s preferred tools. To make the pine flour that was in several dishes he had to cut down a pine tree at just the right time of year, remove the bark, and scrape the spongey new growth layer from the trunk by hand. Then add in another year of leaching, soaking, drying, baking, and grinding. He makes his own vinegars. 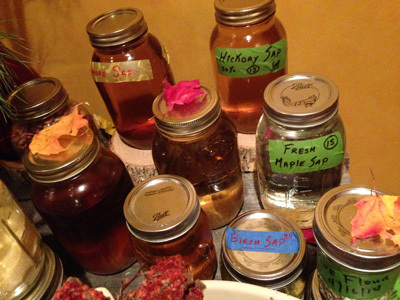 Some of the saps from the trees are salty and used for curing. It’s not just the ingredients, either. Baehrel has invented and perfected some unique cooking techniques using stones. “I find there’s an unpleasant metallic taste to food cooked on [regular pans,]” he told us. Many dishes, like the cured goat sausage, were then smoked: the goat sausage in witch hazel twigs, lending it an incredible perfume-like aroma and flavor. The sirloin we had as a final meat course had been “glass cooked”–on a stone under a glass bowl with a hot light on it for three hours. It was much like the effect of sous vide only without the water and vacuum bag. The meat was fork tender and perfect. The whole meal was not just astonishing for its effort and sourcing, though. It was very top level haute cuisine, on the level with these Michelin-starred restaurants I’ve been mentioning. 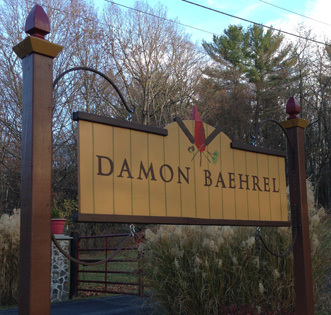 I’d put Damon Baehrel head to head with Barbara Lynch or Thomas Keller any day–theoretically speaking since Baehrel will never have time to go on Top Chef or Iron Chef America. His restaurant is usually open five nights a week, seats only 14, and he’s closed on Mondays and Tuesdays. But with the sheer amount of work he does to prepare ingredients all year round, I don’t think those days are any less work. For example, between phases of the meal, we were served sugarless ices (sugar doesn’t grow in upstate New York, so he uses stevia plant tea, powdered maple seeds, and other naturally sweet plants to sweeten with). One of the slushes was flavored with the horns of the sumac tree. Another was clover. He had to pick a hundred pounds of clover to make 50 servings of the ice. And he picked it at night, so the clover wouldn’t wilt. He told us he only sleeps three or four hours a night. I am under the impression that Damon Baehrel never stands still for very long. Before opening his farmhouse restaurant back in 1989, he tells us he was a motocross racer and he took his (modest) earnings from that to buy the 12-acre plot. He and his wife and father built the farmhouse that houses the restaurant with their own hands, ran a catering business for a while, and then decided to make a go of putting a restaurant in. He also makes his own wine, but isn’t legally allowed to serve it. Instead we had some truly wonderful pairings, while Scott and Irene, who don’t drink alcohol, were given pairings of juice and sap, including elderberry, sycamore, and I don’t remember what else. In the car on the way home we did piece together from memory the basics of 24 courses–the usual meal would have been 20 courses, Damon said, but since we weren’t pressed for time, he asked if it “would be okay” to slip in a few more. Yes! Bring it on! The charcuterie plate was one of the best we’ve had and included guinea fowl, venison, goose, and tamworth ham. (Some of the meats come from a farm he co-owns several miles away.) He’s also an incredible cheesemaker. We had a cheese plate with 12 cheeses, gorgeously accompanied with cayuga and champagne grapes, late-season raspberries, sorrel leaves, and chard. And he’s self-taught. He worked in kitchens here and there, he said, but nothing like culinary school is in his background. He’s re-discovering and re-inventing (or just plain inventing) techniques for making the ingredients, but then on top of that he’s clearly got world class cooking skills. The seafood courses were as delectable and amazing as anything we had in Sant Pau by the ocean (the seafood is the one thing that is trucked in daily). We had peeky toe crab on barberry, mahogany clams in pine oil, prawns on cherry sap, and lobster with goldenrod. We had a slush made from Queen Anne’s Lace, and one from sumac and lemon verbena. A nugget of the turkey leg came in a miniature crock with baked pine bark crunches you would have sworn were fried potato. The food is difficult to describe because one inevitably resorts to comparing it to what it wasn’t. For example, powdered lichen tastes like onion. Shaved burdock root is like potato. On the other hand, powdered lavender verbena tastes like nothing else in the world. Some of the ingredients, like acorn flour, we know of being prepared and used by Native Americans. Others Damon discovered by accident. One day he was collecting sap from the trees and the branches were in his face. He accidentally bit down on a bud and discovered what he expected to be bitter was actually delicious. Only at certain times of year for one or two weeks are certain things edible. 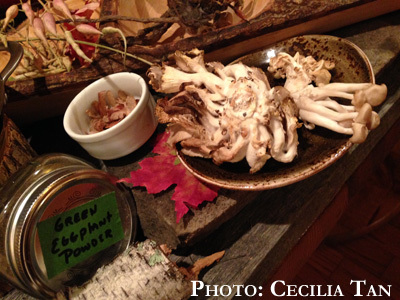 All year round he is collecting, harvesting, and preparing the many saps, flours, powders, roots, mushrooms, stems, barks, and so on. Hardest to describe were the desserts. The only butter or cream in the meal was in the small ramekins on the table for us to butter our bread with: one cow butter, one sheep butter. He doesn’t get enough dairy yield to be able to make his sauces thick or rich with them so instead they are enriched with elements like rutabega broth and hickory nut oil. Lest I mislead you with that description, let me assure you this isn’t anything like when you have a “gluten free brownie” and it tastes like wall plaster and rubber bands. Everything was sumptuous and pleasing to the palate and senses, especially the desserts. He described one as “faux” creme brulee, because the creme was made from duck egg and some non-dairy nut “milk” and the sugar crust was made from crystallized maple sap: it was one of the best creme brulees I’ve had. And then there was the “chocolate” course. Something that resembled a very thick chocolate pudding was spread across the plate and garnished with slivers of dehydrated apricots, preserved peaches, and crushed pine nuts. What it actually was? Hickory nut and acorn “coffee” (i.e. roasted and steeped) that was then left to dehydrate and thicken until it transformed into something that I would have simply sworn was an exotic single-source chocolate. I licked the plate. I feel a little like I did as a child after walking through the woods with my mother after a rainstorm at my grandparents’ farm. It was an incredible feast for the senses, the sounds, the scents, the animals, the flowers, so many things to see! And yet when my grandmother asked me when we came in what we saw I could only remember a few things to tell her (a red eft, a spiderweb, a frog that was still in my pocket…). Some experiences that are so rich in sensory impressions are like that. Seven hours later we left Damon Baehrel knowing we had met one of our generation’s true originals.